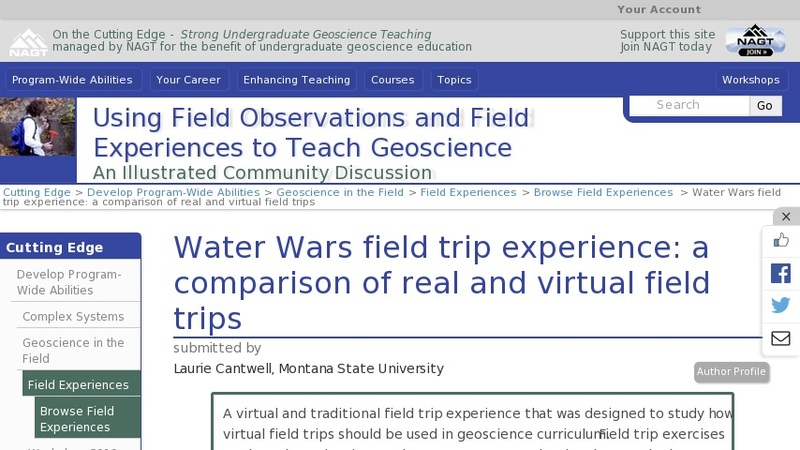 A virtual and traditional field trip experience that was designed to study how virtual field trips should be used in geoscience curriculum. Field trip exercises are based on a local groundwater controversy that involves geologic, hydrologic and environmental policy. Students role-play as geoscientists, evaluate the problem and provide recommendations for addressing the issue. X Hide Caption Cantwell poster for GSA Field Experiences session 2004 Provenance: Lauri Cantwell, Montana State University Reuse: This item is offered under a Creative Commons Attribution-NonCommercial-ShareAlike license http://creativecommons.org/licenses/by-nc-sa/3.0/ You may reuse this item for non-commercial purposes as long as you provide attribution and offer any derivative works under a similar license.